This article will outline what you need to know about WordPress and its filtering mechanism available to you via your posts administration screen. We will detail exactly what the WordPress filters are and the purpose they serve in displaying your post listings. From there we will learn how you can extend your post administration area – by creating new customized WordPress administration filters. By the end you will be able to take what you have learned and apply it to your own projects, allowing you to provide additional information and functionality for your end users. WordPress will output its default filter mechanisms to the posts administration screen. These filters allow you to display only certain posts that match set criteria. For example, you may want to display posts published within a set date period (as shown below). 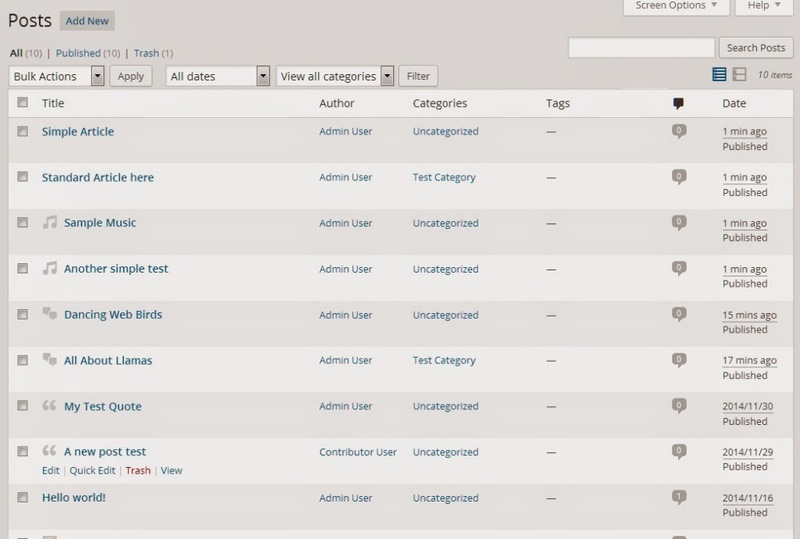 WordPress comes pre-configured with several filters that you can use on your posts administration screen. Additional filters may be added by certain themes and plugins and provide additional filters for you to use. Overall these filters serve the same purpose of allowing you to narrow down your listing of posts based on a set of criteria, viewing only the posts that are relevant given your set criteria. While WordPress comes with its own great set of filters, often you may want to add your own to help your users (or yourself) in narrowing down posts on your administration screen. These two hooks, when combined will allow you to filter your posts by your chosen criteria and return only posts / items that match that criteria. Before we go through and explore these hooks, lets talk about a real world example (so that when we start building our filters you can see how they may be useful). Even though a post will have link with the name of the author, it is possible the user will simply overlook this (along with the small icon displayed that represents the post format type of the post). It is more intuitive to add drop downs to the top of each administration listing screen that implicitly show that your posts will be filtered. This is what we will be doing in this tutorial. The first thing that needs to be done is the creation of the select drop down for the two additional filters we will be making. You will need to navigate over to your child themes functions.php file (or another applicable file) and add code which will add these two new filters to your posts administration screen. Lets step though this code so that you can get an understanding of exactly what we are doing. We create a function and attach it to the restrict_manage_posts action. This gives us access to the filter zone shown at the top of the posts administration page. We get the current post type listing being displayed via the global post_type. We use this to determine if we are on the correct post type (we only want to execute this for posts, not pages or other content types). We intent to call the wp_dropdown_categories WordPress function which will generate a drop down list of all post formats based on a set of criteria. Post formats are actually just one of WordPress’s custom taxonomies (much like categories or tags) and as such we can use this function by supplying a list of arguments. show_option_all – This determines the name that will be shown when we do not want to filter anything (we use this so that you can show ‘all post formats’ and will see all of your post formats). orderby – This is how this will be ordered, I have chosen to order this by its name. order – This determines which way the list will be sorted, I have chosen ascending. name – This is the name of the drop down list itself. You need to give this a unique name so that you can fetch its chosen value later on. taxonomy – (This is important) This value determines which elements will be pulled into the list. Since post formats are just a taxonomy we can specify its taxonomy name of post_format and it will collect the post format terms. After we declare our arguments for the wp_dropdown_categories function, we search the global $_GET variable to see if we have actually already chosen a post format type to filter by. If a value exists we need to add a new argument onto our argument array called selected which basically tells the drop down list which value should be chosen by default. We create a function and attach it to the restrict_manage_posts action. This will give us access to the filters at the top of the posts administration screen. We use the global post_type variable to check to see if we are currently on the correct posts administration screen. We only want to execute on posts. We want to use the wp_dropdown_users function to generate a listing of users on the website. We need to supply the following arguments to it. show_option_all – This determines the default option for the select list. In our case we want it to be ‘All Users’ which would mean we don’t want to filter anything at all. orderby – Determines how the list will be ordered. I have chosen to order just by the name of the author. order – Determines in what order the list will be ordered, I have chosen ascending order. name – The name of the drop down, which will be used later on when we need to fetch the chosen value so we can filter the posts. who – Determines who will be chosen. The only value we can set is authors which will fetch all users who can create posts. include_selected – I have chosen to enable this for simplicities sake. After we declare our arguments for the wp_dropdown_users function, we check the global $_GET to see if we have the drop down value set. If this is set it means that we are already filtering by a user and we need to update the arguments. We set the value of selected to the ID of the author which ensures that the author is selected by default when the page loads. Now that we have an interface in which the user can select their post format and / or authors, we need to filter the listing of posts based on these drop downs. We will do this by hooking into the pre_get_posts filter. The pre_get_postsfilter has access to the current query before it is executed by WordPress and will let us change the posts that will be fetched from the database. We create a function called add_post_format_filter_to_posts and hook it onto the pre_get_posts filter. This filter has access to the global query variable so we also pass that into our function so we can manipulate it. This variable is passed by reference so we don’t need to return or echo any values, any changes to the query will stay. We get the global post_type and page_nowvariables and check to see page_now is equal to edit.php and post_type is equal to post. Essentially we are checking to make sure we are on the post administration screen. We determine if a post format has been selected by checking the $_GET variable. If it has been set, we collect its value. We compare the chosen value to ensure it is not our default value of 0 (default meaning it wants to show all post formats, which is the exact same as not applying a post format filter). As long as we have chosen that we want to filter down to a specific post format, we create modify the query object so that we can tell it only to select only posts matching our chosen post format. certain posts. We modify the query and change its tax_query element so that it filters by post formats. We set the taxonomy to post_format, the fields to ID and then the includes to an array of $post_format (which contains our value we want to filter by). We create a function called add_author_filter_to_posts_query and hook it onto the pre_get_posts filter. This filter has access to the global query variable so we also pass that into our function so we can manipulate it. This variable is passed by reference so we don’t need to return or echo any values, any changes to the query will stay. We check to make sure that the entered value is not 0 as that is our default value. A value of 0 represents the drop down filter option of ‘All Authors’ which would essentially mean that our filter does nothing. If our value is not 0 we access the query_vas inside the query and set the value of author to our ID. Once this is set it will pull posts belonging only to that author id. Once you have this code up and running you will be able to filter your posts by their author. Now that you have a better understanding of WordPress administrative filters, you can use this tutorial and apply it to your own projects. There are a wide range of already provided post attributes that you can filter by. In this tutorial we looked at filtering by the value of author and the taxonomy post_format, but you could easily filter by other values such as the ones listed on the WordPress Query class reference page.